This afternoon, I kissed my sweet Louie on his soft head over and over. I told him what a sweet kitty he was. How I will never forget him. How thankful I was to have had him for 13 years. And as a veterinarian in the emergency vet's office, a place I had promised him I would never take him again, after his inoperable diagnosis on New Year's Eve, pushed the medicine to send Louie to kitty heaven into his vein, I whispered in his ear over and over, "I will love you forever. I will love you forever." In a matter of seconds, he was gone. It has been a long goodbye. Since his diagnosis of vaccine-associated fibrosarcoma in November until early May, Louie's decline was slow. The tumor on the scruff of his neck was growing, but his behavior was unchanged. It opened up at times. Small, nickel-sized pockets in the center of the beast that would claim his life, but two weeks of antibiotics would clear up the open wound and the underlying infection. He was eating. He was drinking. He was snuggling with his mama, Chubbie, just as he did every day, on the ottoman in my office. In early May, things started to change. His tumor began to spread rapidly. It began to open up much larger than it had before. It was draining and had an odor. And Louie, a kitty who had never been very sociable, and who only emerged from hiding after the kids had gone to bed for the night, suddenly was around all the time. He began sleeping in strange spots, places in the house he never visited before. He developed a slight limp, a sign that the tendrils of the tumor were wrapping themselves around the scapula bone of his shoulder. He had difficulty climbing down the stairs. And yet his appetite was good. Excellent even. He was eating all the time, from the feeding stations I set up around the house for him, so he never had to be too far from his food or water. By the end of May, he had begun coming into our bedroom in the middle of the night, usually around 4am, and meowing. I began getting up, going downstairs, and giving him some tuna I had been buying for him. From that point on, every single night, he would come into our room somewhere between 2am and 4am meowing loudly. I would give him the tuna, and yet 30-45 minutes later, he would be back up meowing again. I would go downstairs, he would follow me, and I'd spend time with him on the kitchen floor. Brushing him, petting him, talking to him. I think he was lonely. Chubbie had stopped cuddling with him suddenly a few weeks prior. Eventually, he would head to the adjoining dining room, curl up on his blanket I'd placed there once I saw that he had picked the location as one of his new favorite spots to sleep, and he'd take a nap. By this time, I was wide awake. It was 5am, and sometimes earlier. I rarely went back to sleep. Two weeks ago, he started another round of antibiotics to see if the medication could get the infected tumor under control. At that point, I knew our goodbye would be soon. It became clear about a week ago that the antibiotics were not working this time. He had begun having accidents around the house. He was meowing at me constantly. He would sit and stare into space. He seemed restless and unable to get comfortable. Last week, I called his vet and told him the antibiotics weren't working. He said he could prescribe a stronger one, but because Louie's cancer was incurable, it would maybe buy him a few more weeks. I thought about what to do for a day, and then called his vet and told him it was Louie's time to go. I didn't want to put him through another round of antibiotics, especially when getting him to take his medicine was so difficult for him. I could sense a more rapid decline this time. I was waiting for Louie to tell me it was time. I think his cries, his plaintive meowing, were telling me to help him. On Wednesday, his vet was to come to our house and euthanize him. This morning, I awoke at 6:30am and knew something was not right. Louie hadn't come into our room in the middle of the night, as he had been doing every night for weeks. I went downstairs and discovered he'd had an accident on his blanket. He was sleeping next to it. I gave him some tuna. He ate a few bites, and laid down in the spot where his blanket was (I had put it in the washing machine). Once the kids got up, he headed upstairs. About half hour later, I heard the horrific sound of his small body tumbling halfway down the stairs. He tried to stand, and couldn't. He would take a few steps, and lay down. I felt his limbs and moved them, and he didn't react. Nothing seemed broken. I placed him on his blanket. My friend was knocking at the door to pick me up for a planned breakfast out. I hesitated in my decision to leave. And then I did. The text from home came about an hour later, telling me that Louie's limbs were twitching and to come home soon. We left the restaurant immediately. He was on the blanket where I had left him. Louie lifted his head to greet me. It was clear something was very wrong, and when the hubs came in from outside, where he'd had the kids playing so they wouldn't bother Louie, I told him we needed to get Louie to the vet. He brought in Isabella. I was a mess, and together the hubs and I told her what she already knew. That Louie was sick. His body wasn't working. And then we told her that after right now, she wouldn't see him anymore because he was going to heaven. She was confused, but stroked his fur on his back one last time, and told him she loved him. Then the hubs packed up the kids and took them to my grandma's for the day. I spent the next 15 minutes gently petting his head and body. He purred loudly. He was with me, responding to me, reacting to my touch. And then all of a sudden, he wasn't. His eyes turned glassy. His breathing was labored. His body was on the blanket, but Louie was gone. His limbs went through spastic movements every few minutes. I was alone. And I was hysterical. I was losing him. I called his vet's, which was closed. I then called the emergency veterinary office and told them we needed to bring Louie in. 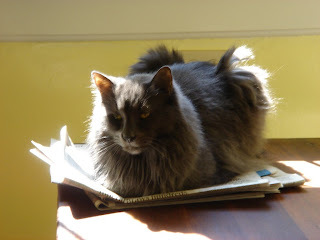 When the hubs came home, I wrapped Louie in his special purple blanket, and held him in my arms for half the car ride to the vet's, my tears coating his soft, gray fur. Midway there, we had to transfer him to his cage because he was agitated. Once there, we entered the same room I had been in when Louie received his inoperable cancer diagnosis. It had come full-circle. The end wasn't supposed to come this way. I promised Louie I would never take him back there. He hated going, and our vet has made house calls for over 10 years for the cats' annual house calls because Louie hated making the trip. I wanted his end to come at home, where he felt loved and safe. And yet in the end, we had to give him the gift of an end to his suffering in a place not of our choosing. I've heard from my sister and my friends in the past week how euthanasia is truly a gift. Our beloved animal companions needn't suffer. This agony is part of sharing life with animals. Their lives, when compared to ours, are tragically short. And yet knowing this does not make the end any easier. I know Louie had a wonderful life. 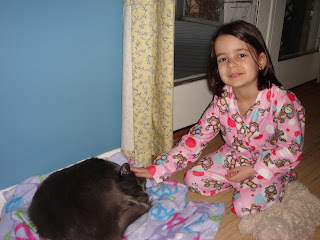 He was able to spend each day of his 13 years with his mama, Chubbie, whom he adored, and his sister, Claudia. And while he was a skittish kitty, did not like loud noises and men, and only sought attention (until he got sick) when the kids were in bed for the night, and then only from me, never the hubs, he was given love and attention whenever he sought it. And while he was never a lap cat, or even a socialable kitty, over the last two months, he was. This awful, horrible, pharmaceutical company-manufactured cancer, which Louie got from his rabies vaccine, took his life, but it also lowered his inhibitions. He became so much more of our daily lives because he spent his days on the main floor of our house, eating in the kitchen, sleeping in the dining room, and visiting the family room, instead of hiding upstairs until the house was quiet. The kids got to know him better. They talked to him. They pet him. They loved him. We took Louie home with us, and buried him in the backyard. The hubs bought a beautiful Japanese tree and planted it beside the grave. It is Louie's tree. The vet's office gave us a clay mold of Louie's pawprints. I have it sitting on the counter in my kitchen. My heart is broken. I feel in so many ways that I let him down. I am full of rage over the how and the why of how he came to have cancer. But these feelings won't bring him back. Instead, I take comfort in knowing he's no longer suffering, that he's in a body that's whole and not broken, and that he's scampering through heaven with my childhood cat, Cheena, and my mom's beloved dog, Chelsea. I love you, sweet Louie. You will live in my heart forever. It's been more than a month since I've posted. There's been loads of work stuff (all good, though, since I am loving my job). There's been kid stuff, and trying to juggle the kid stuff with the work stuff. There's been running stuff (my new exercise schedule includes runs 4 times a week at 5:30am, before the hubs leaves for work). And there's been Louie stuff. He is not doing well. Our goodbye is near, and this affects me so deeply that I cannot even write about it here. Not yet, anyway. So today, I'm writing about my graduate. Today was Isabella's last day of preschool. Her end-of-the-year picnic took place this afternoon. She'll see a bunch of her preschool peeps in the school's summer camp, which runs three mornings a week next week and the week after. And of course, many of them live in our school district, so she'll see them at Kindergarten. At the end-of-the-year picnic last year, I found myself much more emotional than I was this year (and she was headed back to the same preschool at the start of the school year). Isabella had had such a wonderful first year experience, she loved school, and had made many friends, so I felt a certain loss for her. I was worried that maybe her second year wouldn't be as great. That she wouldn't love it quite as much. But she simply thrived this year too, and matured in many ways. I constantly think how lucky I am to have a child who loves learning and the structure of the school environment. In September, she'll head to half-day Kindergarten. She'll ride the bus. She'll have much more structure, more routine, and higher expectations than she's experienced to this point. And I think she's going to rock it.